Businesses are increasingly global, with more mobile employees than ever before. This complicates things when an important message needs to be delivered to hundreds or thousands of people using a range of mobile devices. Doing business in other countries, countries and continents increases the risk of interruptions from severe weather, political unrest or even terrorist attack, making communication all the more important. The Intelligent Notification platform was developed for just such circumstances. Easily notify and alert groups - from one to thousands - of business interruptions, pending disaster or simply for day-to-day communication. 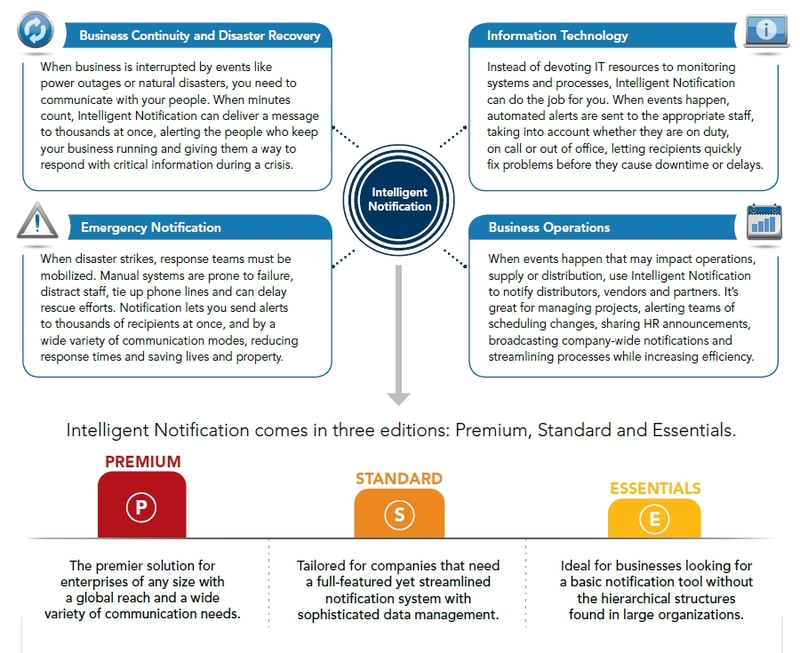 Available as a hosted (SaaS), on-premise, or hybrid solution, Intelligent Notification is used for business continuity and disaster recovery, emergency notification, and to enhance efficiency and productivity throughout the enterprise. TelAlert is an off-the-shelf tool for adding automatic Urgent Message broadcasting capabilities to a Network or System Management Application in a Network Operation Centre (NOC), Trouble Ticketing Tool or other Management Applications. TelAlert is an Urgent Messaging System that can send messages to pagers, telephones, GSM, signboards, loudspeakers, mailboxes and can receive responses by most of these means too. According to the response to the message, escalation procedures can be setup to obtain in a very efficient way a closed-loop messaging system. TelAlert is an off-the-shelf application, in the sense that it only needs to be installed, and a few basic configuration tasks performed, in order to take advantage of its capabilities. Furthermore, it is also an open-ended tool for developing custom applications using shell scripts, C, or Java. 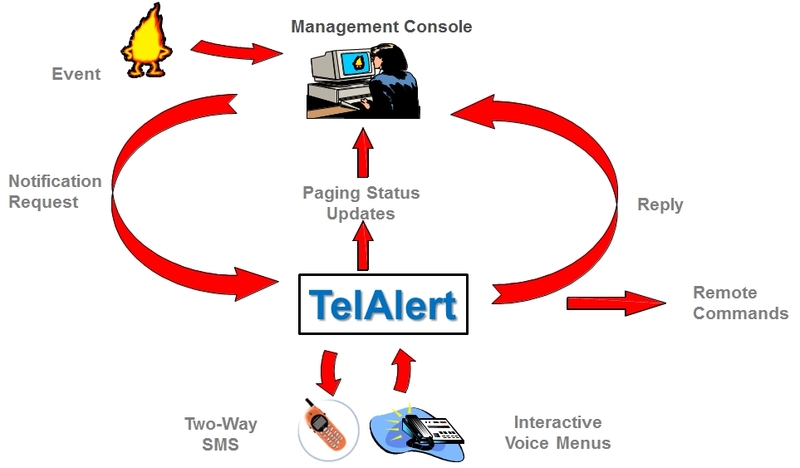 While most of TelAlert's customers use it with network management applications or help-desk systems, it can be integrated with any program capable of issuing commands. It also includes C libraries and Java classes, to be tightly integrated with custom applications. With its optional hardware component, TelAlert can monitor environmental conditions, automatically warn users of potential problems, and allow them to remotely turn devices on or off via a touch-tone phone. TelAlert supports real text-to-speech technologies based on the AT&T Natural Voices library, enabling urgent notifications over the telephone. In nowadays organizations, scalability has become a major aspect in the choice of tools. The cost of maintaining an incident management infrastructure must be kept under control. In a small organization where duty schedules of the engineers are stable (rotating schedules), the small changes that must be applied to the TelAlert configuration can be performed by one single TelAlert administrator. In a more flexible or more complex environment where there are more involved people and where schedule changes are continuously applied (e.g. to face bank holidays, people vacations, unexpected unavailability of engineers...), this means lots of resources spent in feeding TelAlert with new team or people schedules. 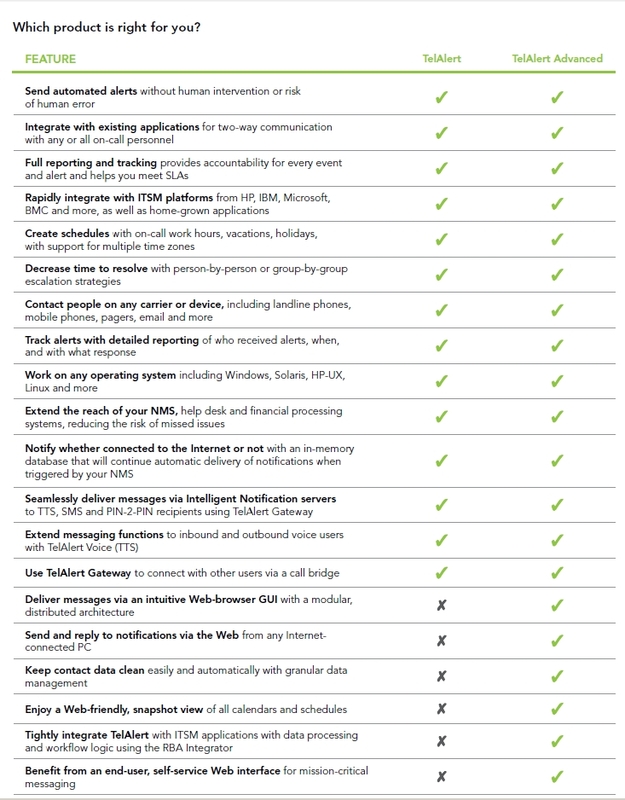 This is precisely what TelAlert Advanced has been developed for. TelAlert Gateway, a SaaS component, seamlessly delivers messages via Intelligent Notification servers to TTS, SMS and PIN-2-PIN recipients. The gateway increases TTS delivery throughput, improves the user experience for TTS recipients and fully supports Intelligent Notification call-bridge functionality. It works by accepting delivery requests from a TelAlert remote port definition and forwarding contact information to Intelligent Notification servers (via INPP protocol). TelAlert configuration definitions directly reference the TelAlert Gateway remote ports. 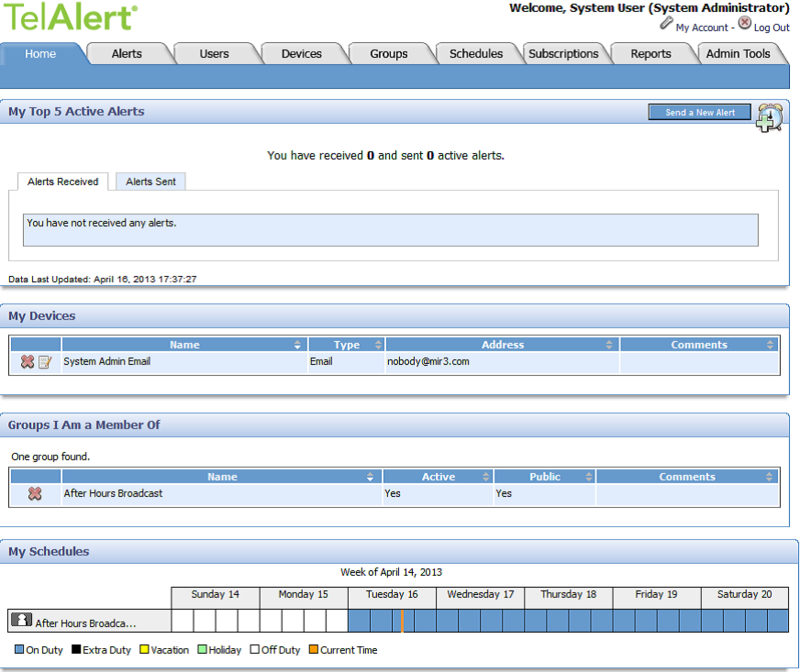 TelAlert event alerts that are delivered via Intelligent Notification are managed the same way as local event alerts. Alerts can contain a mixture of information that is processed by local TelAlert and remote Intelligent Notification port types. 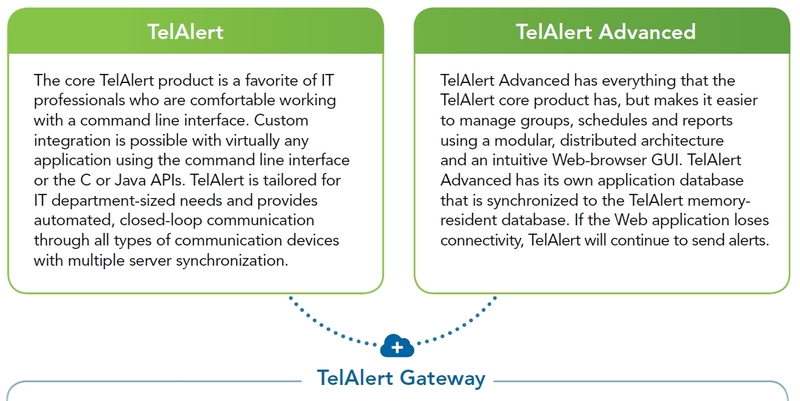 The TelAlert Gateway can be added to either TelAlert or TelAlert Advanced, making either a hybrid version.